The Cigar Broskies: Tatuaje Wolfman Review - Dual Broskies! 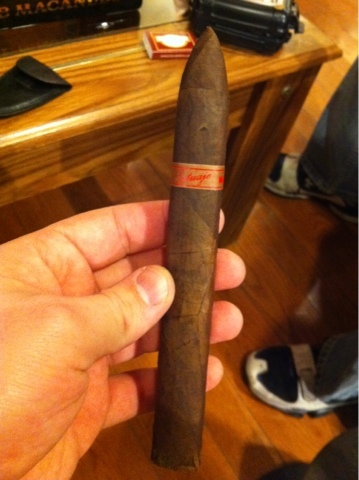 Lyricsninja: It would be remiss to not mention something special about this cigar. With under 25000 total produced, it begins with a smaller subset than a lot of the normal runs. I had the pleasure of being able to see some of the “special” boxes, which is a ragged looking casket with blood drops all over it. Couple it with the fact that the specialized boxes contained 13 cigars (unlucky number), were only sent to 13 (unlucky) stores and that only 666 (the devil!) of these particular boxes exist… yeah. It adds to the whole mystique. Kollarism: Smoked at CI, paired with blue Gatorade. Smoked alongside my brother. Thanks for DarkmanXJ for the opportunity for us to try these. Average score 89.5... but we are going to round this one up to an even 90!